Ladies Wedding Rings in Heart embroidered single personalised handkerchief. Ladies Wedding Rings in Heart embroidered single personalised handkerchief. 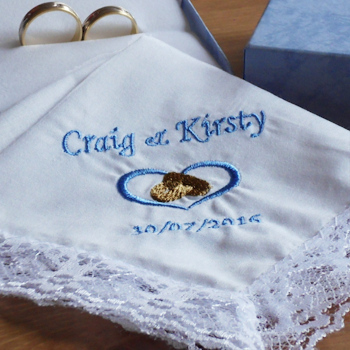 The white lace trim handkerchief can be embroidered with a title, single name or names and a date of your choice.